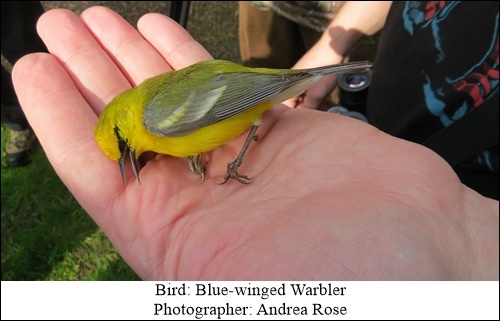 Prevent Window Strikes – Save our Birds! For a birdwatcher, the spring and fall migration seasons are a time to anticipate the marvel of migration that many species of birds undertake to return to and from our continent. North America provides them with sufficient insect resources to raise the next generation, a good return on investment of their flight north. Some of them travel from as far away as Chile, no small feat for a bird that can weigh as little as .46 oz.! This long trip is no simple undertaking; birds face many challenges during migration. Finding food sources, enduring weather extremes and evading predators on a daily basis while traveling is hard enough for birds. If you throw in human factors, namely window strikes, their difficult journey becomes all the more perilous. 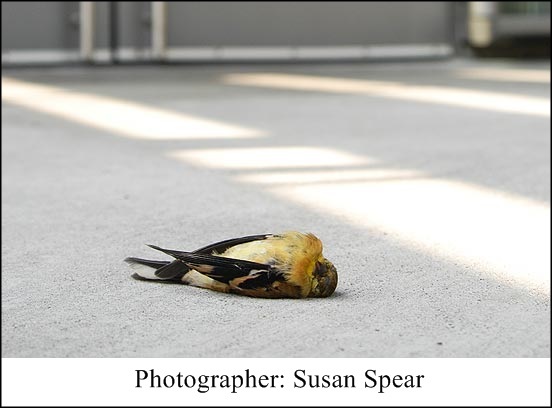 As someone who hears about birds that have met their death by flying into a window on a regular basis, I feel compelled to educate as many people as possible about how to prevent this sad situation. Most of the reports of this type of death happen during the migration months. If foliage or sky is reflected in the glass, that is what the bird is seeing, and indicates that your window is a potential hazard. The American Bird Conservancy estimates we lose a billion birds each year as a result of this relatively new challenge the birds face. I say “relatively new” because birds have been migrating for many years longer than we have had buildings with windows constructed on this continent. The birds see the reflection of the out of doors in windows and fly into them, thinking they are flying into continued habitat. Window strikes can be prevented. Start by identifying the windows that pose the greatest threats. Large picture windows or a pair of windows at right angles to each other are usually the most dangerous. Stand in your yard and look at what the bird is seeing. If it is foliage or sky reflected in the glass, that is what the bird is seeing, and indicates that your window is a potential hazard. To prevent window strikes, there are products that are placed on the outside of the windows. Cover the glass on the outside with window screening or netting at least 3 inches from the glass, taut enough to bounce birds off before they can hit the glass. Small-mesh netting is best (5/8″ in diameter), so if birds do fly into it they won’t get their heads or bodies entangled but will bounce off unharmed. You can mount the netting on a frame, such as a storm-window frame, for easy installation and removal. You can also place decals, stickers, or mylar strips on the outside of the window. Keep in mind that these are only effective when placed very close together. Current studies reveal that four inches apart is the best solution. At Wild Birds Unlimited in Grosse Pointe Woods we carry American Bird Conservancy bird tape and Window Alert decals. Both products are made of a component that brilliantly reflects the ultraviolet sunlight. With vision twelve times better than ours, birds see this as a “stoplight”. Very importantly, the decals need to be replaced every six to nine months, the tape strips every four years as they lose their effectiveness with the fading of the UV coating as a result of sun exposure. We all have windows so we all have the potential to create a lethal situation for migratory birds. Let’s get the word out to all our friends and families so that we can prevent something that IS so preventable. A bird in the trees is worth far more than a bird in the hand.